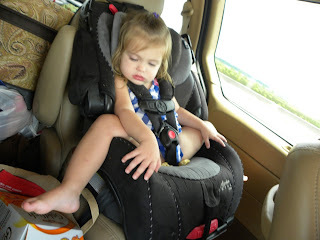 Someday I'll Sleep Autism Blogs: Day 3 of the Great Cross Country Drive: Biloxi to Houston! Day 3 of the Great Cross Country Drive: Biloxi to Houston! The day started out with a band when Mae woke up on the wrong side of the crib and expressed her outrage over every single moment of the morning until we packed up and left the hotel. When it was my turn to get ready she screamed outside the bathroom. Paul thought that it was me she was missing, but when I emerged and he went to get ready she spent her time crying for him. Or so I thought. It turns out she was actually screaming to go into the bathroom because she had grand plans to remove all the tissues from the tissue holder and fling them around the bathroom. The first picture is of the view from our room in Biloxi. The Gulf is right there on the left hand side. You can see a part of a casino that was being built that looks to have been abandoned some time ago. 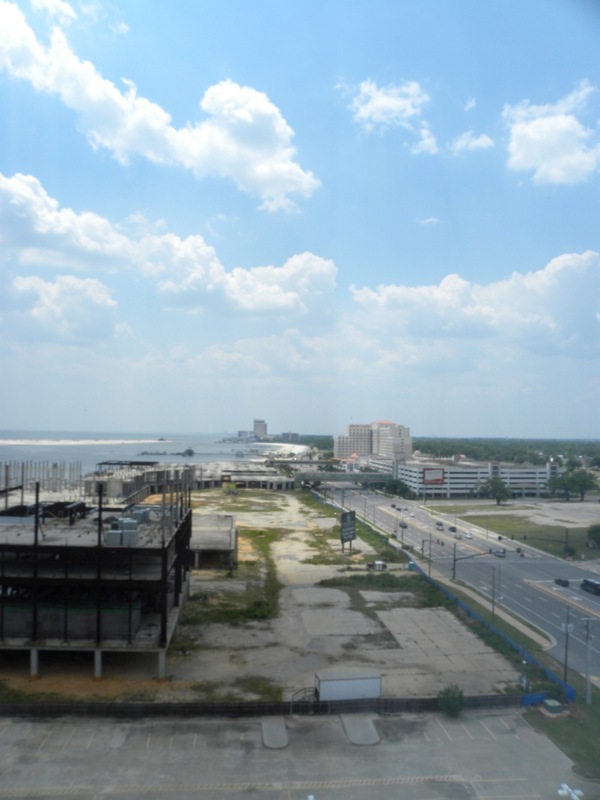 Biloxi feels like it has so much potential. The parts we visited were all very neat and clean, but the economic downturn and the echos of Katrina remain (at least that's what I'm guessing was the cause of the many foundations and lots that had been neatly cleared but looked as if they'd once been something...). As someone who'd never been there before it was hard to tell what was the result of the economic down turn (the casino perhaps?) and what were the remnants of the loss brought on my the storm (one foundation looked like it had been a spectacular old mansion right by the water...). 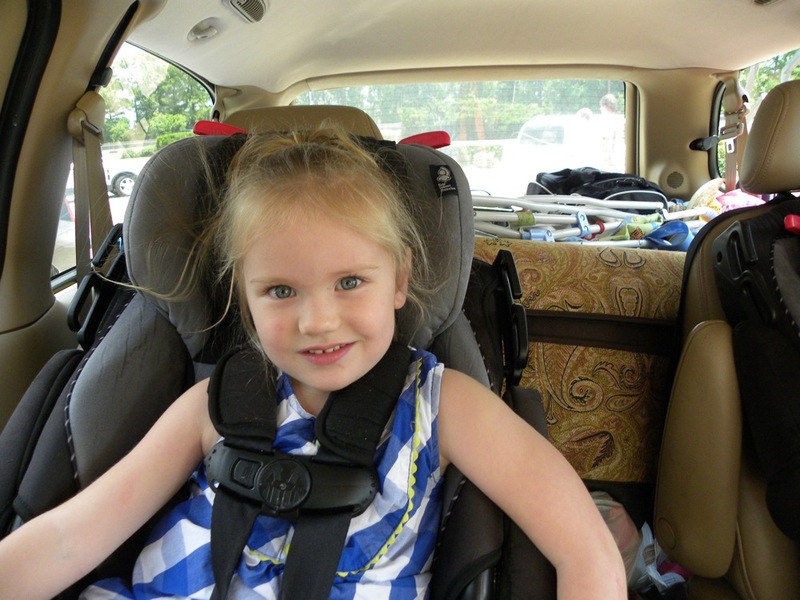 Once we finally made it out to the car Mae fell silent and sat quietly kicking her feet and chuckling to herself as she looked out the window. We were on the freeway by 9 am, headed west. By mid-morning we were in Louisiana and I realized something. When we moved to Florida I had this picture in my head of what I imagined Florida was supposed to look like. This picture wasn’t exactly well informed… it was based on elementary school books and foggily remembered geography lessons and a fear of alligators... and maybe even from occasionally catching some special that involved guys hunting/wrestling with alligators. You see, because of the alligators I’d never really wanted to go to Florida and apparently I’d never paid much attention beyond that small, reptilian fact. Once when I described to Paul the picture I had in my head he pointed out that it sounded like I’d expected a bayou. 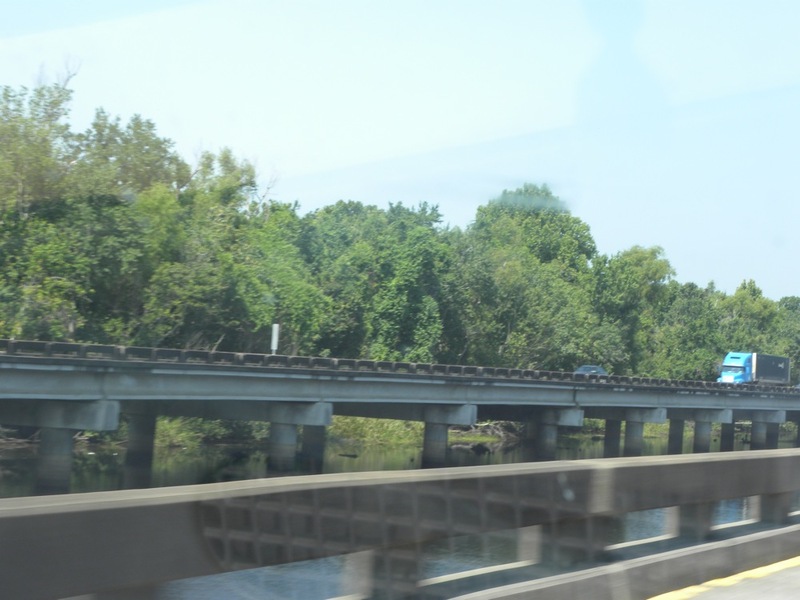 Today we drove from one side of Louisiana to the other, along Interstate 10, and apparently bayou is exactly what I’d expected. When we moved to Florida I’d expected Louisiana. I’d expected the green vine covered trees and the snaking streams through the thick foliage. Alligator Alley, with its mostly dead trees (at least when we drove through… maybe it was a seasonal thing?) and grass was bound to be disappointing next to the verdant picture I’d painted in my mind. Of course my real beef with our tiny retiree corner of South West Florida, at least when we first arrived there, was that strip malls seemed to outnumber architecture predating 1990 at something like 100 to 1. And let me tell you, I’ve never seen a strip mall that brought to mind the word “charm.” It's like the charm got bulldozed by developers looking to make a quick buck (don't they know how boring it is to completely wipe out the history of a place, even if we really really need a 175th shopping center option?). That is a change I’m savoring as we move west across the south. Thankfully I’m getting my fill of the beautiful brick buildings and the fantastic old houses that exist outside of our little realm of school year existence. There was the matter of our planned route going onto highway 12 east of New Orleans… apparently we were supposed to take that off ramp, but in my excitement over driving through New Orleans I missed that part of my driving directions and sent us through the city, only noticing that we were supposed to take another route when we were nearly to Baton Rouge. This meant my claim (which was true) not to have seen that part of the directions sounded a little fishy to Paul, who couldn’t help but be suspicious of the happy (for me) coincidence that basically meant I got my way (I really hadn’t seen that part of the directions because I wasn’t expecting to be told to get off I-10 and then back on! Our surprise of the day (other than the $3.40-something gas prices and the fact that our car was averaging over 21 miles to the gallon which isn’t bad for a 13 year old mini van!) was when we went through the drive through at a Taco Bell in Lafayette for lunch. We placed our order and then sat, staring at the total. It was a full five dollars less than or normal total. Was the order missing something? We sat staring at the little drive through screen. Nope. Apparently fast food in Florida and California are just quite a bit more expensive than fast food in other parts of the country. I guess prices must vary? As we approached the border with Texas I pointed something out to Paul. 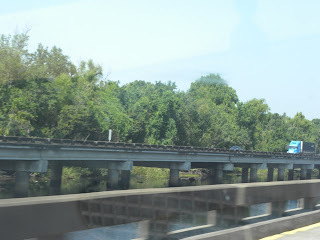 “Remember that spectacular rest stop when we first entered Louisiana? Has there been another one along the way? I haven’t seen one. I bet there’s another spectacular one by the Texas border? “ And there was, right next to a beautiful lake (although I could have missed other stops when we weren’t desperately searching for them…). They were the two prettiest rest stops I’ve ever seen. One thing that has changed is that, once upon a time, I think I would have thought 90 degrees in Alabama, Mississippi, Louisiana and Texas were unbearably hot. Instead each time I’ve gotten out of the car I’ve marveled at how nice it is. I’m sure it will be humid in all of these places later, and maybe it’s already humid now (I have a feeling it would have felt humid to me 10 months ago), but it’s not South West Florida humid quite yet and the air has felt beautifully dry to me these past few days (that makes me really excited about Arizona and Nevada!). When we arrived in Houston we faced our final challenge of the day. Google insisted that our hotel was on I-10 and had refused to give us an off ramp. After much searching we found our hotel, found that it was on a one way street, doubled back twice to reach it, and finally pulled into the parking lot. I collapsed on the bed and we ordered take out. And now Sadie and Mae are playing in the tub and pretending it’s the pool that Mommy and Daddy are way too tired to take them down to. And now for the Sadie quote of the day: (as she and her sister raced back and forth across the room) "We're playing nature. I'm the hunter!" I'll have to keep an extra close eye on those two. I've also just got to add the picture that Sadie demanded I take as we were entering Texas with a "Quick, Mom, get your camera! Take a picture! Quick! 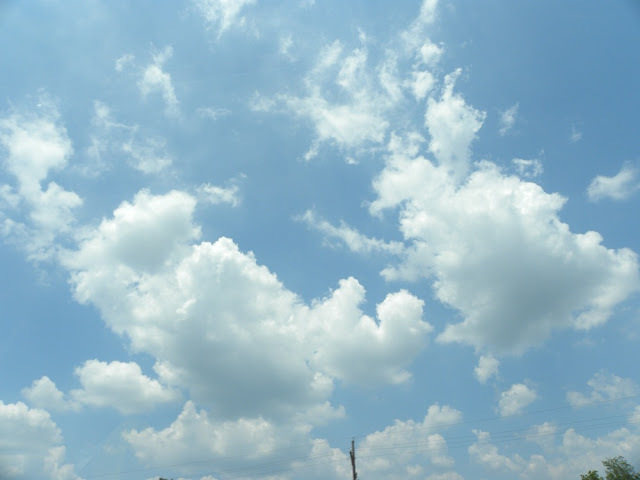 Take a picture of the clouds..."
Now to begin the long trek across Texas… Paul keeps talking about driving across Texas like it’s a great trial (he’s done it a number of times on his own)… I guess we’ll see what it’s like with a toddler and a preschooler! That should take this “trial” to a whole different level! Yep I lived along a lot of I-10 throughout my life. From Thibodaux, to Hammond as far west as Lafayette and now Houston. Make sure to stop at Buc-ees on the way from Houston to San Antonio! You wont regret it! I'm guessing you took I-10 at Slidell, down through New Orleans, and then back up to Baton Rouge. As there is usually horrendous traffic on I-12 near Baton Rouge, it might not have been a bad detour. The Lousiana Welcome Ctr. really is pretty. We often stop there en route to Baton Rouge to visit our daughter. They have been doing construction forever. We also used to stop at the Texas one with regularity, when she lived in Austin. 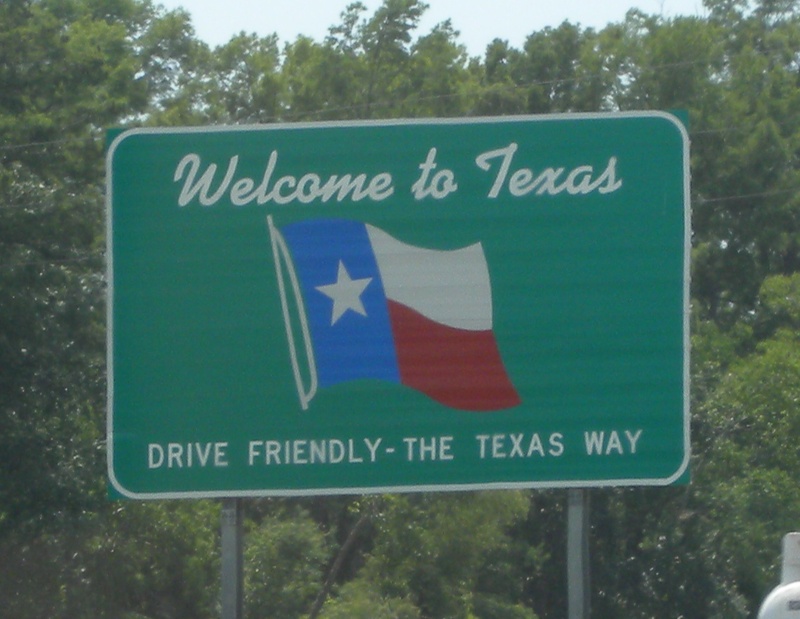 Traveling across Texas seems interminable; hope you didn't hit Houston at rush hour - hideous!!! My husband spent 4.5 months in Biloxi. I spent a weekend visiting while he was down there. We went to an amazing restaurant called Mary Mahoney's and I'm pretty sure that was the best meal of my life (which is saying something as I'm a trained chef). They have a 2000 year old oak in their courtyard that has withstood every hurricane to come through there, including Katrina. It's beautiful! Have fun, and make sure you get some Texas BBQ, it's completely different from the kind they have in Alabama.